Monday night class time is now 5:30 and taught by Val. Are you ready to feel younger, stronger, & leaner? Receive authentic instruction where the instructor is monitoring your form, not doing the workout herself. Receive Quality instruction to help you feel stronger, longer, & more youthful through movement, and ​education of body alignment principals in class & life. Start with one class per week for about 6-8 weeks taking the modification offerings during class. Slowly increase the options of the poses in class, and together we can decide when you're ready for two classes per week. We are happy to help you along your safe improvement in strength, balance, postural awareness & strength, and core. You'll feel & see a noticeable difference in 4 Weeks! For all you do, don't you deserve one hour of tranquility? Take a break from rushing around. ​let the calm come right in. ​classes while encouraging you to listen to your body. ​She is encouraging, positive, and happy to have you enjoy safe, alignment-oriented movement that gets you stronger & more toned. 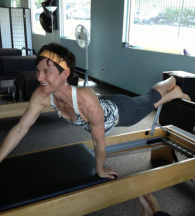 Rhonda Morgan is a pilates enthusiast who has been practicing Pilates herself for almost 20 years. She offers challenging mat sessions that encourage you to be your strongest, healthiest and happiest self. She also likes to incorporate various props like the foam roller, arc, and ring to add variety to the classic mat session. As a grandmother, artist, avid kayaker, and museum director, Rhonda brings a diverse and fun loving personality to every session. To join one of Rhonda's Pilates Mat classes contact her at rhondamorgan111@gmail.com. EmPower generally follows the Roanoke City School Systems for weather cancellations and delays. Exceptions include If the weather appears fine, & the schools have been cancelled for a prediction of weather or if schools are cancelled for severe cold. If unsure contact erin@empowerpilates.net. Or Check our Facebook posts for any weather-related class cancellations. Registered students will receive an email alert. Sign up to receive our 6 POSTURE TIPS TO MAKE YOU LOOK & FEEL YOUNGER video, fitness tips, pain-relieving techniques, and our newsletter.